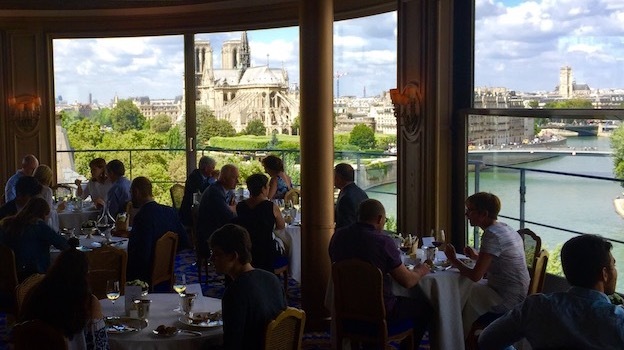 The legendary La Tour d’Argent is a restaurant I never tire of. I go back as often as I can. 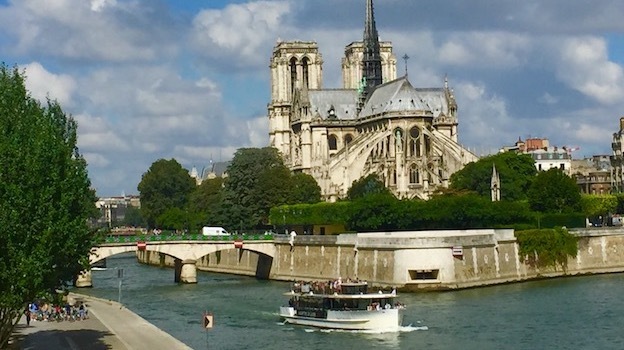 I love its panoramic views of the Seine and Notre Dame, the spacious, bright dining room, the monumental wine list and the ultra-knowledgeable, gentlemanly head sommelier David Ridgeway, and of course, the food. So I was curious to try the cuisine of new chef Philippe Labbé, who took over the kitchen from Laurent Delarbre in May 2016. Labbé has a strong curriculum. He was named “Chef of the Year” in 2013 by Gault Millau and plied his trade at shrines of fine dining such as the Plaza Athenée, the two Michelin star Abeille of the Shangri-La hotel, la Chèvre d’or in Èze-Village, and most recently in Alsace’s famous Arnsbourg restaurant in Baerenthal. Clearly, he was picked with the goal of lightening up and modernizing La Tour’s extremely classic menu, but also of regaining the second Michelin star La Tour d’Argent lost in 2006 (actually, La Tour d’Argent was once a three Michelin star eatery, but was demoted to two stars back in 1996). Of course, it remains to be seen if the move will prove to be successful; but frankly, given all the positives I can think of about La Tour d’Argent, and the so-so level of numerous two star establishments all lover the world, the place is more than two star-worthy. As I love eating here, it was not without some trepidation that I walked in, thinking of the many pressed duck and crêpes “Belle Époque” that had graced tummies over the decades. 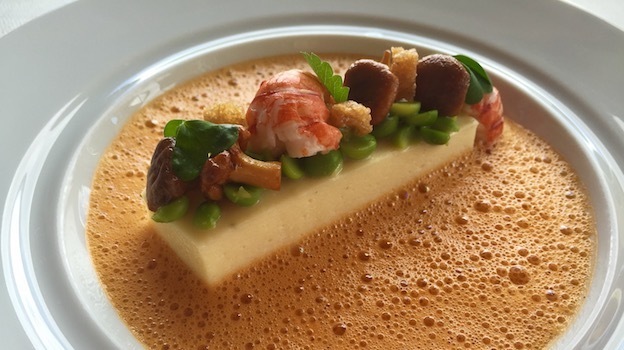 For one, I absolutely loved the old rendition of the quenelle de brochet façon André Terrail and wondered what new twists might lead to in revisiting old classics. The new version is undoubtedly lighter and airier, just as good as the old rendition, only different. 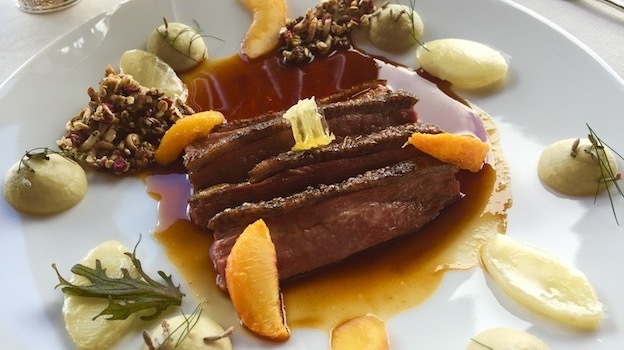 However, I couldn’t help but thinking that La Tour d’Argent might want to consider setting up a small box on the menu listing one or two classic dishes from the previous regime. In all honesty, as good as the new querelles are, having the choice, I’d still opt for the previous version almost every time. There were no such concerns with the rest of the meal, which was absolutely fabulous, especially the delicate, flavorful Vincent Libourel tomato, highlighted by a delicate saffron twist to the goat cheese, with hints of fresh herbs and almonds adding further complexity. 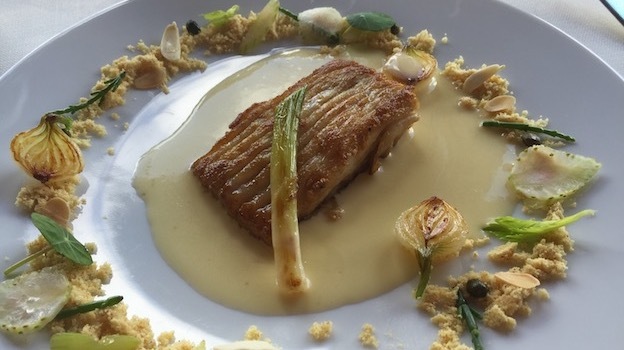 Also excellent was the skate wing, and though I’ll admit that I’ve never met one that I didn’t think was just swell, Labbé’s version with capers, almonds, hazelnut powder and samphires is especially refined and savory. The apricot dessert, complicated by a touch of almonds and olives, was a perfect ending to the meal. 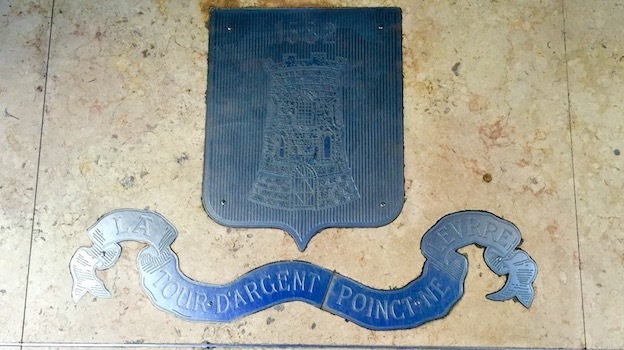 As usual, I drank very well at La Tour d’Argent, and it really couldn’t be any different given the over 400,000 bottles resting in the deep, dimly lit cellars. I decided to kick things off with two lovely Coche-Dury Meursaults side-by-side. 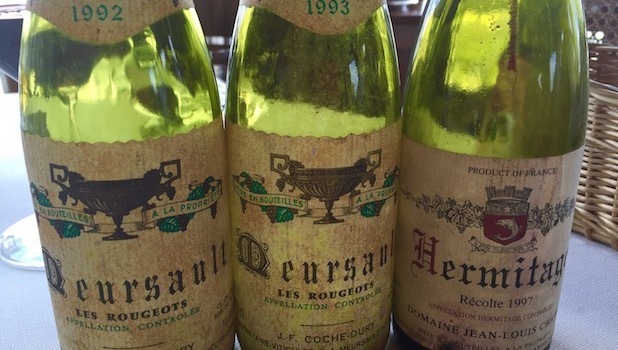 The 1993 Coche-Dury Mersault Les Rougeots and 1992 Coche-Dury Mersault Les Rougeots are both outstanding, if in different ways. The first wine, from the unheralded 1993 vintage, is, not surprisingly, the leaner of the two, but also fresher and more vibrant its lemony orchard fruit cleansing the palate after each bite. The 1992 is texturally beautiful, even opulent, and a real step up in density compared to the 1993, but I find its almost fat, caramelly personality to lack a little acid lift. It is hard to choose between the two, but the 1993 is a better food wine. Clearly, I am splitting hairs here: while Les Rougeots is never the most complex of Meursaults, it’s a highly dependable source of solid white Burgundy that delivers a good and very typical Meursault experience. This, despite the less than auspicious origin of the site’s name (“les Rougeots” refers to black rot disease, which tends to turn vine leaves red, or rouge). With the duck, the 1997 Jean-Louis Chave Hermitage turns out to be just what the doctor ordered. Grilled herbs, smoke, cedar complement plush red cherry and dark plum aromas and flavors. Fine-grained tannins give this alluring red a silky mouth-feel and an easy to drink quality that is irresistible. The 1997 is a pure pleasure to drink right now, but will age another fifteen years effortlessly. La Tour d’Argent boasts a veritable who’s who of patrons, including the likes of actresses Lauren Bacall and Anita Ekberg, singer Paul McCartney, even Queen Elizabeth II and Emperor Hirohito of Japan. Without doubt, André Terrail and his mother Tarja Terrail (Claude Terrail passed away in 2006) have a legendary address to run and be proud of (founded by Rourteau in 1582, this is probably France’s oldest restaurant) and the new course they are steering is likely to reap more rewards in the future for their deservedly famous dining establishment.